Create books for minecraft. 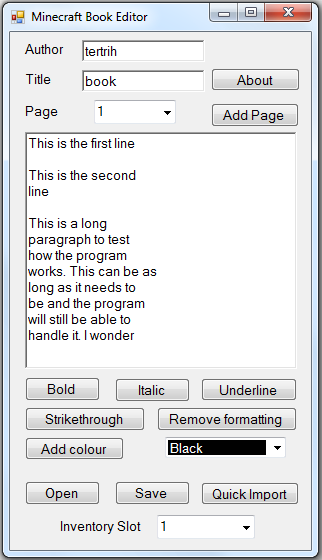 You can either write them out yourself, or use the quick import option which allows you to import a plain text document into the program. 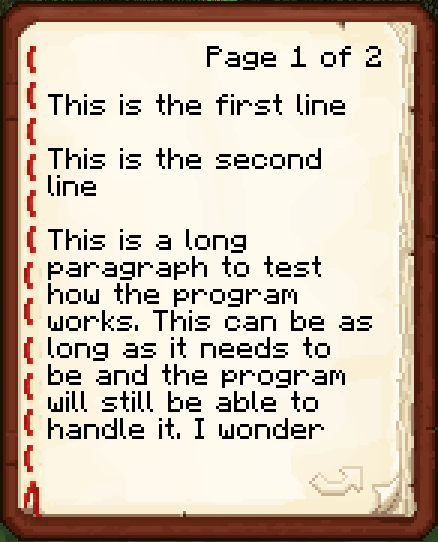 The text file is formatted for the minecraft book, and multiple pages are created if needed. 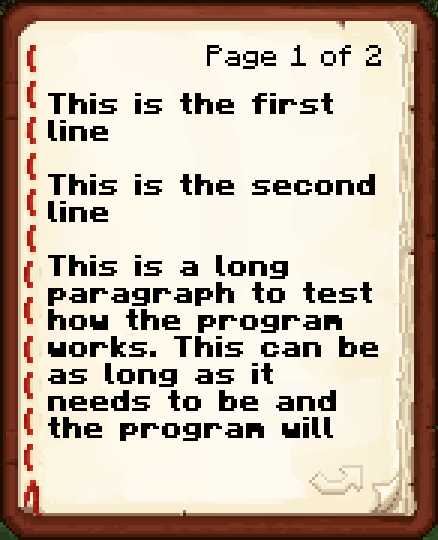 You can then save the book directly into a players inventory. Just find the player data file, select the inventory slot you want the book placed into and then click save. Awesome! Can you give me source codes? Oh, this has great potential! I have a friend who write fanfics and I've always wanted to transcribe it into mc books for a library on a server. We'll all be pleased! But is there a chance you add the posibility to use also pictures in the books? This would be awesome if this is makeable. This looks like a super useful tool. I'm having trouble opening up my player data though. The player.dat file I'm trying to open is from a 1.8.3 bukkit server. Any help would be appreciated since I'm going to be making a ton of books. 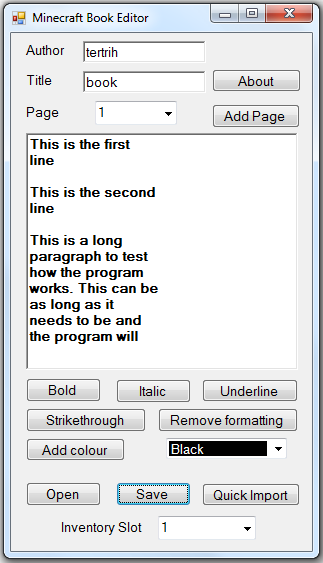 Would it be possible to add a way to save the book you write with this as a regular txt-file? With all the mods and plugins that let you import books it would make my life a lot easier since I have no use for a written book in my inventory, I need them in the mods folder. Just a question. This is still the best way I've found to write books outside of minecraft, only I have to copy/paste the text to a txt-file afterwards. So, saving as a txt-file would help making it easier to continue on a book another time if I'm not yet done. Would this work in multiplayer by chance? I'm having the same error. Hopefully the creator will see this and give a solution. "Exception occurred saving player data: Unable to cast object of type 'NBTSharp.TagString' to type 'NBTSharp.TagShort'." Noooooo, this is exactly what I was looking for whyyyyyyyyyyy?! Hope that help you like it help me. This needs to be in the page. Thanks so much by the way.